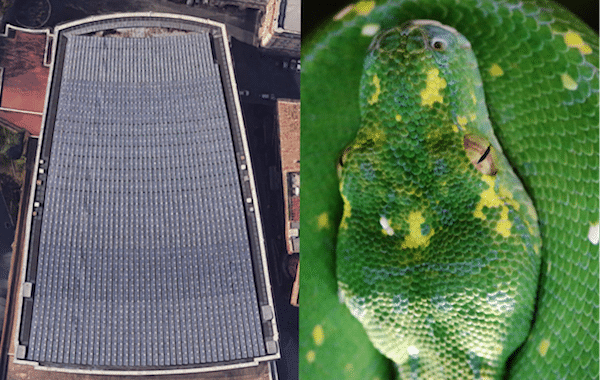 Among the many strange and suspicious statues, fountains, facades and structures that occupy Vatican City, the Pope’s Audience Hall stands out for its uncanny resemblance to a snake. Completed in 1971, the peculiar structure sits only partly within the actual boundary of the City/State, and the whole building inside and out is unmistakably reptilian. It’s officially named the Paul VI Audience Hall, after Pope Paul the Sixth, who reigned from 1963 to 1978. Apparently he was a decent Pope, although he has been implicated in covering up or ignoring the sexual abuse of young boys by members of the Catholic clergy. He was alerted to these scandals in a letter by Rev. Gerald M.C. Fitzgerald in August 1963, and was advised to take serous action against pedophiles, although he never did anything. In this overhead photo, the building stands out for its unusual shape, which is innocuous enough until juxtaposed with a viper’s head. 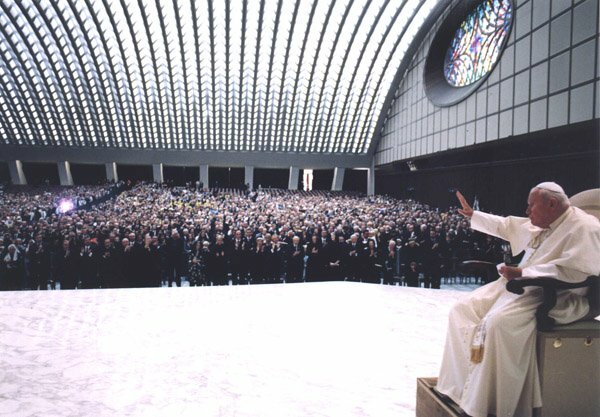 Designed by award-winning Italian architect Pier Luigi Nervi, the building is designed to seat 6300 people for conference with the Pope himself, who presents from a stage in front of a giant Satanic looking sculpture. Named The Resurrection, La Resurrezione, the sculpture was designed by or Pericle Fazzini. and was inspired by the idea of Christ rising from the blast of a nuclear explosion. 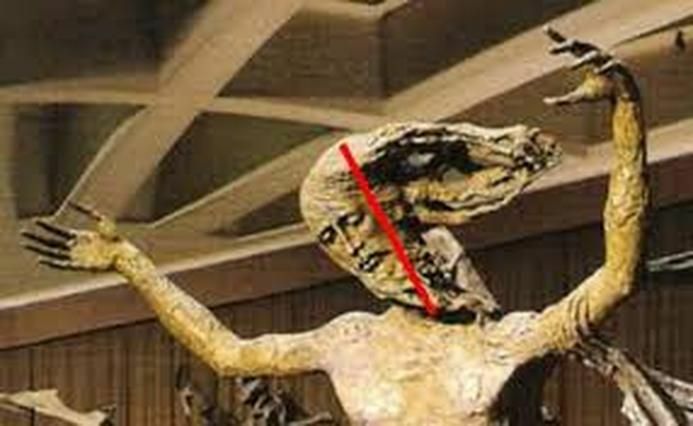 Oddly, from an angle, the head of Christ looks suspiciously like the head of a snake with its fangs open, prepared to bite. The interior of the Audience Hall also closely resembles a serpent, strikingly with two fangs positioned over the stage. Both from the stage, and from the audience’s entry way, the room unmistakably resembles a snake, even though some write this off as delusional thinking, warning people away from considering it’s deeper meaning. Human pattern recognition is wonky. We tend to see faces in clouds and rock formations. Same here. Pareidolia it is called. The photographer specifically selected lens and position as to invoke snake imagery. Here is the view from the entry way. Is this just a trick on the eyes? And from the Pope’s position on stage… with more teeth. 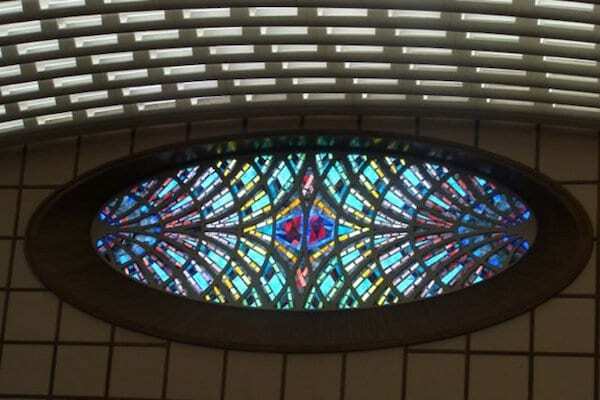 The massive stained-glass windows on the sides of the hall are also quite reptilian in their design, featuring vertical slits in oval-shaped eyes. The Vatican, while located in Rome, is it’s own sovereign nation state, and a look around the grounds reveals unimaginable wealth and a plethora of strangely symbolic pieces. 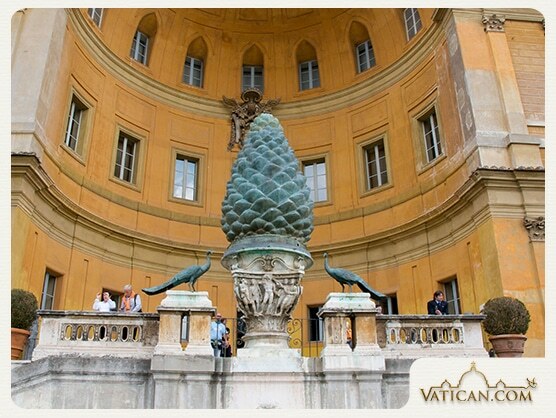 The famous Fontana della Pigna is a massive pine cone which is believed by many to represent the pineal gland, a tiny gland within the human brain believed to be the source of spiritual experience. 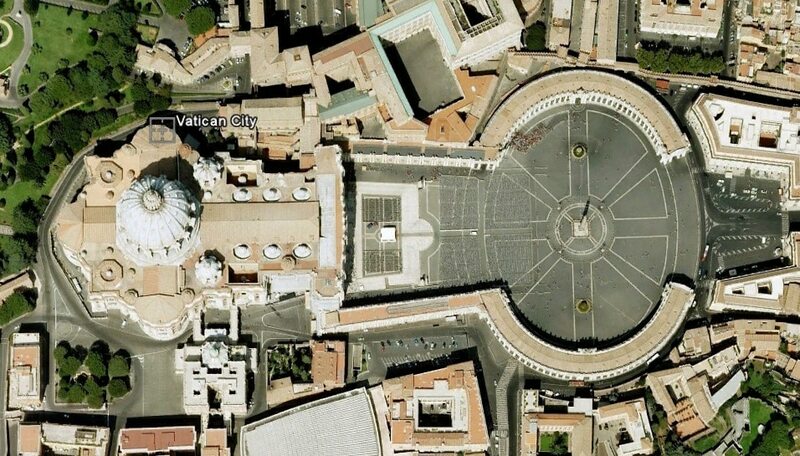 Of course, the Vatican itself is easily recognizable from above as a giant keyhole, symbolizing the gates of heaven. 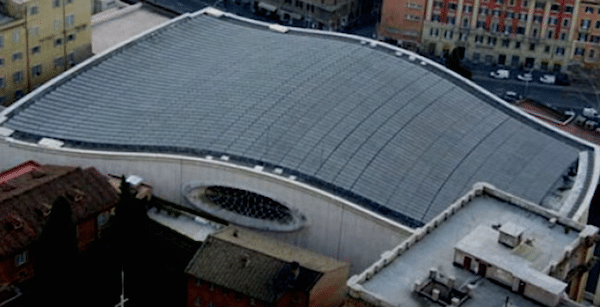 Design like this does not happen per chance, and the world’s capital of great architecture, Rome, it is ludicrous to think that a famous architect could design a building that just accidentally looks like a giant snake’s head, even though the Vatican denies the resemblance. For years, independent investigators have worked to point out the dark symbolism of the Catholic Church, noting that symbolism in architecture has long been used ton convey hidden meaning. “6 YHWH sent fiery serpents among the people, and they bit the people; and many people of Israel died. 7 The people came to Moses, and said, “We have sinned, because we have spoken against YHWH, and against you. 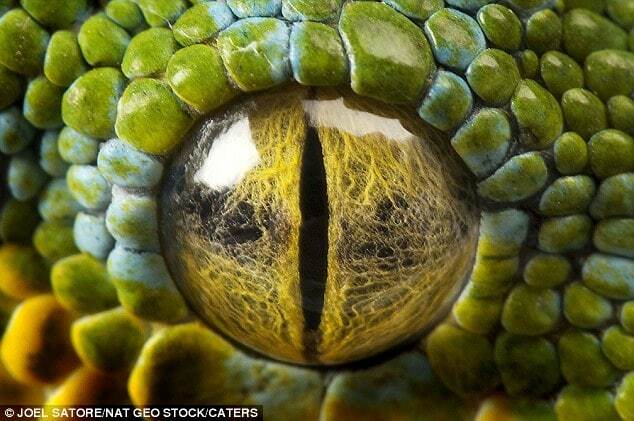 Pray to YHWH, that he take away the serpents from us.” Moses prayed for the people. In the Bible, the snake symbolizes both wisdom, as in the Adam and Eve tale, but more commonly it represents the presence of evil. 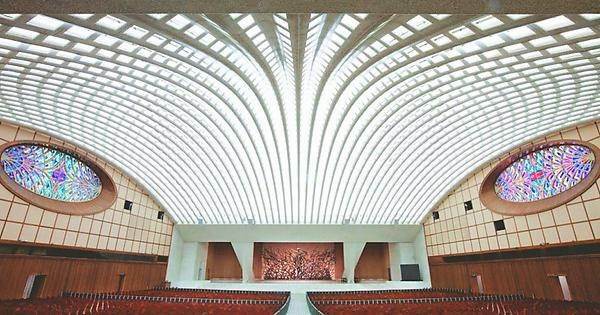 If you add to this the story of the Illuminati bloodlines and the theory that the global elite are part of a reptilian hybrid race on non-humans who rule over us with powerful institutions like the church, then the Pope’s Audience Hall invokes even more curiosity. Either way, the Audience hall definitely has an evil vibe to it, and this is no accident. The following presentation by David Icke goes much deeper into this viewpoint. 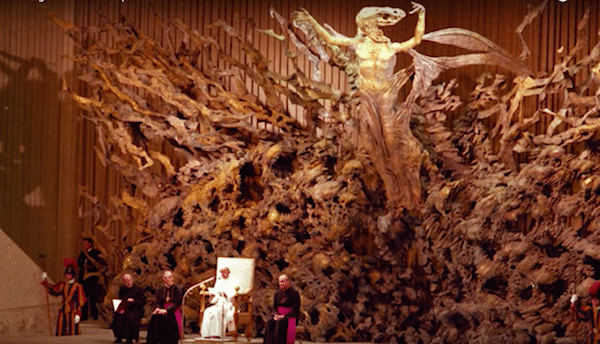 This article (Inside the Pope’s Reptilian Audience Hall in Vatican City) was originally created and published by Waking Times and is published here under a Creative Commons license with attribution to Buck Rogers and WakingTimes.com. It may be re-posted freely with proper attribution, author bio, and this copyright statement.